Home>News and Media>Connect with VTA>Can Single-Bore Tunneling Transform Urban Subway Construction? Dennis Ratcliffe is an attorney and civil engineer serving as VTA's BART Extensions Program Director. He wrote this article. VTA is evaluating a tunneling methodology that would use a single, large diameter tunnel to construct its next BART extension through the downtown core of San Jose. This evaluation of the single-bore method has revealed a number of unique advantages and opportunities for urban subway construction. The single-bore method compartmentalizes the large diameter tunnel into separate trainways. In this method, the tunnel and boarding platforms are constructed completely independently of the station structures. This configuration is made possible by recent innovations in large-bore tunneling equipment and related control technologies. The station entrances (ticketing halls) which include ticketing, fare gates, station agent booth, and vertical circulation elements are constructed off-street (two entrances per station). 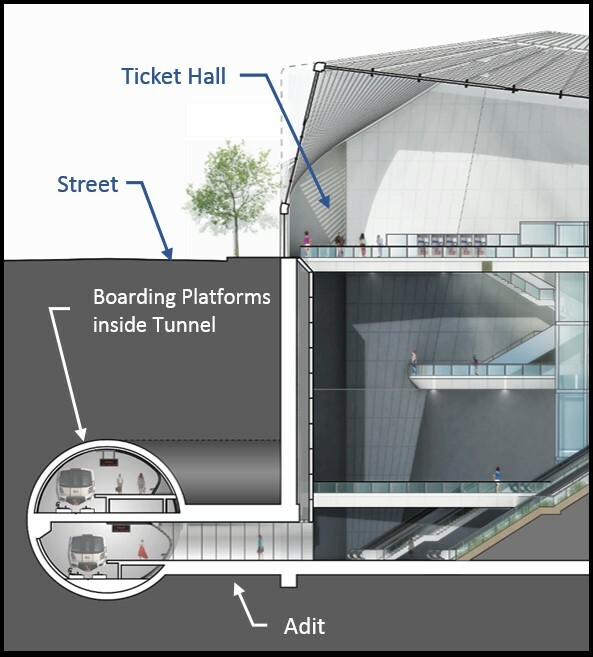 The connection between the tunnel and the ticketing halls can also be constructed without disruption at the surface by mining an access corridor (or Adit) between the tunnel and the bottom of the ticketing hall. Conventional subway construction entails the use of cut‑and‑cover techniques that involve removing the street surface, relocating and protecting existing utilities, and excavating down from the street level. This method is highly disruptive to auto and pedestrian traffic, and has significant negative impacts on existing businesses. 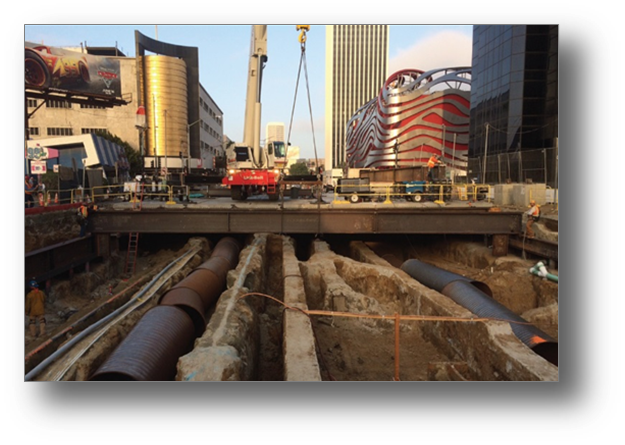 The picture to the right shows cut-and-cover construction on the Purple Line Extension in Los Angeles. The conventional subway construction approach attempts to reduce these impacts by using two smaller TBM’s to construct the trackways in separate running tunnels between stations, but this method still requires cut-and-cover methods to construct the stations. For the subway planned in San Jose, using cut-and-cover techniques would require the downtown station excavations to be approximately 1,800 feet long, 60 feet deep, and would extend from curb to curb. The single-bore method avoids most of these in-street impacts because the tunnel, trackways, and boarding platforms are all constructed below ground without disruption at the surface. Also, because the ticketing hall facilities are constructed off-street, the construction disruption for these facilities is limited and comparable to construction of any high-rise building with a basement. The underground connection between the ticketing halls and the boarding platforms can also be constructed without disruption at the surface through the use of mining techniques such as ground freezing. San Jose is typical of urban revival now being experienced all across the country. Millennials are leading a trend toward urban living for both work and home, and cities are responding by creating housing, workplaces, and entertainment destinations in their urban core. Millennials are seeking a lifestyle that is not dependent on the automobile, especially without long commutes behind the wheel. Convenient public transit is a key attribute of their ideal urban lifestyle, and in the urban setting this means constructing a subway. How does Single-Bore address the major issues? Disruption – The principal problem of subway construction in the downtown core stems from the disruption to the auto and pedestrian infrastructure caused by cut-and-cover construction methods. In most cases the subway station is needed at the most vibrant area of the city – the very location that will be most negatively affected by its construction. Because the single bore method can be constructed almost entirely underground, it avoids this problem. To understand the advantages, one must simply compare five years of construction disruption using the conventional methods to five years of continued business and economic development while subway construction continues underground relatively unnoticed using the single-bore approach. Streetscape – Conventional cut-and-cover subway stations typically have relatively narrow stairway/escalator passages located on the sidewalk leading to the ticketing mezzanine below the roadway. This arrangement compromises the sidewalk width and generally degrades the streetscape. Unless these facilities are enclosed with a lockable head houses, these areas attract unwanted activities during off hours. Because the single-bore method constructs all the ticketing facilities off-street behind the sidewalk, the sidewalk width is not impaired and the ticketing hall can be fully enclosed and secured in the same way as any other building in the downtown core. Joint Development – The single-bore method has significant potential for joint development in the downtown core because all transit-related facilities are contained in a basement-like structure. This leaves a substantial area on the first floor and the full area on the floors above available for additional public or private sector development. This is doubly valuable as the ticketing hall facility can itself become a downtown destination, not merely a point of transit to other destinations. Safety – The single-bore method also has safety advantages over conventional cut-and-cover methods. Because the entire ticketing hall is maintained as a place of safety, evacuation from a train fire is simplified. Passengers reach the point of safety as soon as they leave the back of the boarding platform. Also, since the running tunnels are constructed in separate chambers, passengers that are evacuating the train mid-tunnel can reach the non-incident tunnel through frequently spaced fire doors. If San Jose constructs its downtown subway using the single bore method, it will be the first of its kind in North America, and the first in the world for a high-volume heavy-rail transit subway. Demonstrating its viability here will position the nation as a leading innovator in transit, and will enable the construction of effective transit in many city centers where it would otherwise be impractical. BART’s success as a high-capacity regional transit system has pushed ridership to its physical capacity limits. Inevitably, a second crossing of San Francisco Bay will have to be constructed. Given the relatively high development densities in San Francisco and Oakland, the single-bore configuration in this crossing would provide significant benefits by expanding this successful system without the negative impacts of construction.